Aachen (German pronunciation: [ˈʔaːxən] , also known in English by its French name Aix-la-Chapelle) has historically been a spa town in North Rhine-Westphalia, Germany. Aachen was a favoured residence of Charlemagne, and the place of coronation of the Kings of Germany. Geographically, Aachen is the westernmost town of Germany, located along its borders with Belgium and the Netherlands, 65 km (40 mi) west of Cologne. RWTH Aachen University, one of Germany's Universities of Excellence, is located in the city. Aachen's predominant economic focus is on science, engineering, information technology and related sectors. In 2009, Aachen was ranked 8th among cities in Germany for innovation. Medieval architecture can be found in Aachen. A quarry on the Lousberg, which was first used in Neolithic times, attests to the long occupation of the site of Aachen. No larger settlements, however, have been found to have existed in this remote rural area, located at least 15 km from the nearest road even in Roman times, up to the early medieval period when the place is mentioned as a king's mansion for the first time, not long before Charlemagne became ruler of the Germanic Franks. Since Roman times, the hot springs at Aachen have been channeled into baths. There are currently two places to "take the waters", at the Carolus Thermen complex and the bathhouse in Burtscheid. There is some documentary proof that the Romans named the hot sulfur springs of Aachen Aquis-Granum, and indeed to this day the city is known in Italian as Aquisgrana, in Spanish as Aquisgrán and in Polish as Akwizgran. The name Granus has lately been identified as that of a Celtic deity. In French-speaking areas of the former Empire, the word aquis evolved into the modern Aix. Construction of Aix-la-Chapelle, by Jean Fouquet. After Roman times, Einhard mentions that in 765–6 Pippin the Younger spent both Christmas and Easter at Aquis villa ("Et celebravit natalem Domini in Aquis villa et pascha similiter. "), which must have been sufficiently equipped to support the royal household for several months. In the year of his coronation as King of Franks, 768, Charlemagne came to spend Christmas at Aachen for the first time. 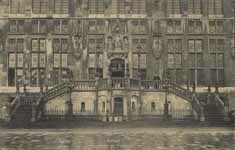 He went on to remain there in a mansion which he may have extended, although there is no source attesting to any significant building activity at Aachen in his time, apart from the building of the Palatine Chapel in Aachen (since 1929, cathedral) and the palatial presentation halls. Charlemagne spent most winters between 792 and his death in 814 in Aachen, which became the focus of his court and the political centre of his empire. After his death, the king was buried in the church which he had built; his original tomb has been lost, while his alleged remains are preserved in the shrine where he was reburied after being declared a saint; his saintliness, however, was never very widely acknowledged outside the bishopric of Liège where he may still be venerated by tradition. In 936, Otto I was crowned king of the kingdom in the collegiate church built by Charlemagne. Over the next 500 years, most kings of Germany destined to reign over the Holy Roman Empire were crowned in Aachen. The last king to be crowned here was Ferdinand I in 1531. During the Middle Ages, Aachen remained a city of regional importance, due to its proximity to Flanders, achieving a modest position in the trade in woollen cloths, favoured by imperial privilege. The city remained a Free Imperial City, subject to the Emperor only, but was politically far too weak to influence the policies of any of its neighbours. The only dominion it had was over Burtscheid, a neighbouring territory ruled by a Benedictine abbess. It was forced to accept that all of its traffic must pass through the "Aachener Reich". Even in the late 18th century the Abbess of Burtscheid was prevented from building a road linking her territory to the neighbouring estates of the duke of Jülich; the city of Aachen even deployed its handful of soldiers to chase away the road-diggers. From the early 16th century, Aachen lost power. A fire devastated the city in 1656. Aachen became attractive as a spa by the middle of the 17th century, not so much because of the effects of the hot springs on the health of its visitors but because Aachen was then — and remained well into the 19th century — a place of high-level prostitution in Europe. Traces of this hidden agenda of the city's history is found in the 18th century guidebooks to Aachen as well as to the other spas; the main indication for visiting patients, ironically, was syphilis; only by the end of the 19th century had rheuma become the most important object of cures at Aachen and Burtscheid. Aachen was chosen as the site of several important congresses and peace treaties: the first congress of Aachen (often referred to as Congress of Aix-la-Chapelle in English) in 1668, leading to the First Treaty of Aachen in the same year which ended the War of Devolution. The second congress ended with the second treaty in 1748, finishing the War of the Austrian Succession. The third congress took place in 1818 to decide the fate of occupied Napoleonic France. By the middle of the 19th century, industrialization swept away most of the city's medieval rules of production and commerce, although the entirely corrupt remains of the city's mediæval constitution was kept in place (compare the famous remarks of Georg Forster in his Ansichten vom Niederrhein) until 1801, when Aachen became the "chef-lieu du département de la Roer" in Napoléon's First French Empire. In 1815 after the Napoleonic Wars, the Kingdom of Prussia took over and the city became one of its most socially and politically backward centres until the end of the 19th century. Administered within the Rhine Province, by 1880 the population was 80,000. Starting in 1840, the railway from Cologne to Belgium passed through Aachen. The city suffered extreme overcrowding and deplorable sanitary conditions up to 1875 when the medieval fortifications were finally abandoned as a limit to building operations and new, less miserable quarters were built in the eastern part of the city, where drainage of waste liquids was easiest. In 1880, the Aachen tramway network was opened, and in 1895 it was electrified. In the 19th century and up to the 1930s, the city was important for the production of railway locomotives and carriages, iron, pins, needles, buttons, tobacco, woollen goods, and silk goods. 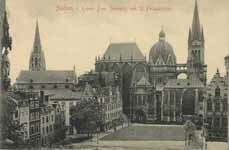 Aachen was heavily damaged during World War II. The city and its fortified sourroundings were encircled 13 September-16 October 1944 by the US 1st Infantry Division and 3rd Armored Division in conjunction with the US 2nd Armored Division and 30th Infantry Division during the prolonged Battle of Aachen, later reinforced by US 28th Infantry Division elements. Direct assaults through the heavily defended city finally forced the German garrison to surrender on 21 October 1944. 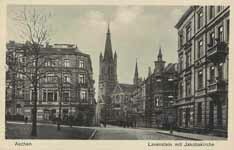 Aachen was the first German city to be captured by the Allies. The city was destroyed partially — and in some parts completely — during the fighting, mostly by American artillery fire and demolitions carried out by the Waffen-SS defenders. Damaged buildings included the medieval churches of St. Foillan, St. Paul and St. Nicholas, and the Rathaus (city hall), although Aachen Cathedral was largely unscathed. Only 4,000 inhabitants remained in the city; the rest had followed evacuation orders. Its first Allied-appointed mayor, Franz Oppenhoff, was murdered by an SS commando unit. While the emperor's palace no longer exists, the church built by Charlemagne is still the main attraction of the city. In addition to holding the remains of its founder, it became the burial place of his successor Otto III. Aachen Cathedral has been designated as a UNESCO World Heritage Site. In the Carolus Thermen named for Charlemagne. Aachen Cathedral was erected on the orders of Charlemagne in AD 786 and was on completion the largest cathedral north of the Alps. On his death Charlemagne's remains were interred in the cathedral and can be seen there to this day. The cathedral was extended several times in later ages, turning it into a curious and unique mixture of building styles. For 600 years, from 936 to 1531, Aachen Cathedral was the church of coronation for 30 German kings and 12 queens. The 14th century city hall lies between two central places, the Markt (market place) and the Katschhof (between city hall and cathedral). The coronation hall is on the first floor of the building. Inside you can find five frescoes by the Aachen artist Alfre Rethel which show legendary scenes from the life of Charlemagne, as well as Charlemagne's signature. The Grashaus, a late medieval house at the Markt, is one of the oldest non-religious buildings in downtown Aachen. It hosts the city archive. 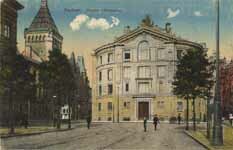 The Grashaus was the former city hall before the present building took over this function. The Elisenbrunnen is one of the most famous sights of Aachen. It is a neo-classical hall covering one of the city's famous fountains. It is just a minute away from the cathedral. Just a few steps in south-eastern direction lies the 19th century theatre. Also well-known and well worth seeing are the two remaining city gates, the Ponttor, one half mile northwest of the cathedral, and the Kleinmarschiertor, close to the central railway station. There are also a few parts of both medieval city walls left, most of them integrated into more recent buildings, but some others still visible. There are even five towers left, some of which are used for housing. There are many other places and objects worth seeing, for example a notable number of churches and monasteries, a few remarkable 17th- and 18th-century buildings in the particular Baroque style typical of the region, a collection of statues and monuments, park areas, cemeteries, among others. The area's industrial history is reflected in dozens of 19th- and early 20th-century manufacturing sites in the city. Aachen has a large number of spin-offs from the university's IT-technology department and is a major centre of IT development in Germany. Due to the low level of investment in cross-border railway projects, the city has preserved a slot within the Thalys high-speed train network which uses existing tracks on its last 70 km from Belgium to Cologne. The airport that serves Aachen, Maastricht Aachen Airport, is located about 40 km away in Dutch territory, close to the town of Beek. Aachen was the administrative centre for the coal-mining industries in neighbouring places to the northeast; it never played any role in brown coal mining, however, neither in administrative or industrial terms. Products manufactured in or around Aachen include electronics, chemicals, plastics, textiles, glass, cosmetics, and needles and pins. Its most important source of revenue, the textile industries, have been dead for almost half a century now. 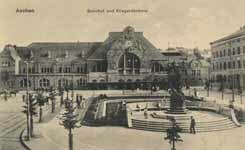 Aachen's railway station, the Hauptbahnhof (Central Station), was constructed in 1841 at the Cologne-Aachen railway line and replaced in 1905, moving it significantly closer to the city centre. It serves main lines to Cologne, Mönchengladbach and Liège as well as branch lines to Heerlen, Alsdorf, Stolberg and Eschweiler. ICE high speed trains from Brussels via Cologne to Frankfurt am Main and Thalys trains from Paris to Cologne also stop at Aachen Central Station. Four RE lines and two RB lines connect Aachen with the Ruhrgebiet, Mönchengladbach, Liège, Düsseldorf and the Siegerland. The Euregiobahn, a regional railway system, reaches several minor cities in the Aachen region. There are four smaller stations in Aachen: Aachen West, Aachen Schanz, Aachen-Rothe Erde and Eilendorf. Only slower trains stop at these, but Aachen-West has developed enormous importance due to the expanding RWTH Aachen university. Aachen is connected to the Autobahn A4 (West-East), A44 (North-South) and A544 (a smaller motorway from the A4 to the Europaplatz near the city centre). Due to the enormous amount of traffic at the Aachen road interchange, there is often serious traffic accumulation, which is why there are plans to expand the interchange in the coming years. The nearest airports are Düsseldorf International Airport (80 km), Cologne Bonn Airport (90 km) and Maastricht Aachen Airport (40 km). The annual CHIO (short for the French term Concours Hippique International Officiel) is the biggest equestrian meeting of the world and among horsemen considered to be as prestigious for equitation as the tournament of Wimbledon for tennis. Aachen hosted the 2006 FEI World Equestrian Games and 2011 CHIO Aachen. The local football team Alemannia Aachen had a short run-out in Germany's first division, after its promotion in 2006. However, the team could not sustain its status and is now back in the second division. The stadium "Tivoli", opened in 1928, served as the venue for the team's home games and was well known for its incomparable atmosphere throughout the whole of the second division. Today, the stadium is used by the amateurs, whilst the Bundesliga Club holds its games in the new stadium "Neuer Tivoli" – meaning New Tivoli- a couple of metres down the road. The building work for the stadium which has a capacity of 32.960, began in May 2008 and was completed by the beginning of 2009. In the South of the city you can find Aachen's biggest tennis club "TC Grün Weiss", which hosts the famous ATP Tournament once a year. Since 1950, a committee of Aachen citizens annually awards the Karlspreis (German for ‘Charlemagne Award’) to personalities of outstanding service to the unification of Europe. The International Charlemagne Prize of Aachen was awarded in the year 2000 to the President of the United States, Bill Clinton, for his special personal contribution to cooperation with the states of Europe, for the preservation of peace, freedom, democracy and human rights in Europe, and for his support of the enlargement of the European Union. In 2003 the medal was awarded to Valéry Giscard d'Estaing. In 2004, Pope John Paul II's efforts to unite Europe were honoured with an ‘Extraordinary Charlemagne Medal’, which was awarded for the first time ever. Most recently in 2011, the Charlemagne Award was conferred on Jean-Claude Trichet, the president of the European Central Bank. He was acknowledged for his critical role in the stability of the euro despite the economic crises that prevailed in many economic powers. Aachen is at the western end of the Benrath line that divides High German to the south from the rest of the West Germanic speech area to the north. Aachen has the hottest springs of Central Europe with water temperatures of 74°C(165°F). The water contains a considerable percentage of common salt and other sodium salts and sulphur. 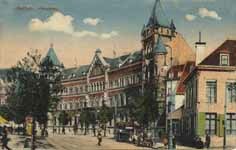 As a spa city, Aachen could use the title Bad Aachen, but as the town then would not appear in first place on alphabetically ordered lists, it declined to do so. Aachen is also famous for its carnival (Karneval, Fasching), in which families dress in colorful costumes. The Scotch-Club in Aachen was the first discothèque since October 19, 1959. Klaus Quirini as DJ Heinrich was the first DJ ever. The local specialty of Aachen is an originally stonehard type of sweet bread, baked in large flat loaves, called Aachener Printen. Unlike gingerbread (German: Lebkuchen), which is sweetened with honey, Printen are sweetened with sugar. Today, a soft version is sold under the same name which follows an entirely different recipe. House of the family of Mies van der Rohe. King Ethelwulf of Wessex, father of Alfred the Great was born in Aachen. Ludwig Mies van der Rohe, one of the founders of modern architecture and the last director of the Bauhaus during its period in Dessau and Berlin was born in Aachen as well. In 1850 Paul Julius Reuter founded the Reuters News Agency in Aachen which transferred messages between Brussels and Aachen using carrier pigeons. Anne Frank's mother, Edith Frank is born here as well. RWTH Aachen University, established as Polytechnicum in 1870, is one of the Germany's Universities of Excellence with strong emphasis on technological research, especially for electrical and mechanical engineering, computer sciences, physics, and chemistry. The university clinics attached to the RWTH, the Klinikum Aachen, is the biggest single-building hospital in Europe. Over time, a host of software and computer industries have developed around the university. It also maintains a botanical garden (the Botanischer Garten Aachen). FH Aachen, Aachen University of Applied Sciences (AcUAS) was founded in 1971. The AcUAS offers a classic engineering education in professions like Mechatronics, Construction Engineering, Mechanical Engineering or Electrical Engineering. German and international students are educated in more than 20 international or foreign-oriented programs and can acquire German as well as international degrees (Bachelor/Master) or Doppeldiplome (double degrees). Foreign students accounts for more than 21% of the student body. The German Army's Technical School (Technische Schule des Heeres und Fachschule des Heeres für Technik) is in Aachen. Belgium Liège, Belgium; since 1955. France Reims, France; since 1967. United Kingdom Halifax, England, United Kingdom; since 1979. Spain Toledo, Castile–La Mancha, Spain; since 1985. China Ningbo, China; since 1986. Germany Naumburg, Germany; since 1988. United States Arlington County, Virginia, United States; since 1993. South Africa Cape Town, South Africa; since 1999. Russia Kostroma, Russia; since 2005. Israel Rosh HaAyin, Israel; since 2007. Republic of Ireland Baltimore, Ireland; since 2010. ^ "Amtliche Bevölkerungszahlen" (in German). Landesbetrieb Information und Technik NRW. 31 December 2010. ^ a b c d e f g Bridgwater, W. & Beatrice Aldrich. (1966) The Columbia-Viking Desk Encyclopædia. Columbia University. p11. ^ "Aachen". (2006). In Encyclopædia Britannica. Retrieved 9 December 2006, from Encyclopædia Britannica Online. 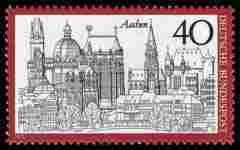 ^ "About Aachen". Aachen Institute for Advanced Study in Computational Engineering Science (AICES) at RWTH Aachen University. Retrieved 2009-10-23.